Call him the strikeout king. No one in Minor League baseball this season has struck out more batters than Jose Suarez. The Angels No. 11 prospect tied a career mark by fanning 11 over five scoreless innings for Double-A Mobile on Monday, allowing two hits and one walk. 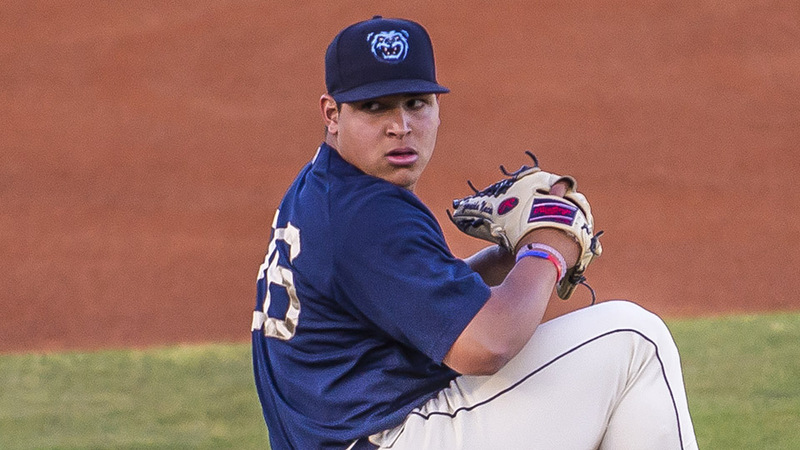 The BayBears went on to a 1-0 victory over host Jacksonville in the first game of a doubleheader at Bragan Field. "I guess everything was working for him. This kid can really pitch for a 20-year-old," Mobile manager Lou Marson said. "Had great command with the fastball, curveball and changeup. He just has great body control out there. He has a great feel for what he wants to do. He's pretty special for such a young age." The 11 whiffs brought Suarez's strikeout total to 69 on the season in just 38 2/3 innings between Class A Advanced Inland Empire and Mobile, giving him a 15.8 K/9 ratio. The 20-year-old has fanned 42 percent of batters he's faced, which ranks second in the Minors. Having known him for approximately one month, Marson said he has been impressed with Suarez's body language and the way he carries himself on and off the field. "He's very confident out there," the manager said. "He commands the strike zone. Honestly, he can throw any pitch in any count. I keep repeating myself. He's pretty special." Suarez (2-1) was on the attack early and often Monday. The left-hander retired the first eight batters, striking out six of them, before allowing a walk to Chris Diaz with two outs in the third. He uncorked a wild pitch to move Diaz into scoring position, but came back to get Mason Davis swinging and end the threat. "We have great confidence every time he's going to take the mound and every time he starts," Marson said. "It's always a good day when he takes the ball." Both hits Suarez surrendered came in the fourth. Marlins No. 1 prospect Monte Harrison singled to lead off the inning, breaking up the no-hitter, but he was promptly erased when Suarez induced a double-play ball from Cade Gotta. Miami's 30th-ranked prospect, John Norwood, sent a knock up the middle with two outs, but the Venezuela native struck Eric Jagielo out swinging to end the inning. "It says a lot about him," Marson said. "He gives up a couple of hits, he bears down and makes some pitches with runners in scoring position." Suarez cruised through the fifth inning, striking out the side and ending his outing with a bang. The 2017 MiLB.com Organizational All-Star threw 53 of his 81 pitches for strikes, with two groundouts and a single out through the air to complement his bevy of strikeouts. Suarez exudes a coolness on the mound that's rare in a prospect, Marson said. "He's in Double-A as a 20-year-old and he acts like he's throwing a game in the Arizona Fall League," Marson said. "That's a good thing. He's just free and loose and has fun playing the game." The Angels' Minor League Pitcher of the Month for April lowered his ERA to 3.03 in his second scoreless start of the season. He blanked Rancho Cucamonga over four innings in California League play. That was his final start for the 66ers before being promoted to Double-A. "He's got three plus pitches -- fastball, curveball, changeup," Marson said. "His fastball is 94 [miles per hour] and he can then throw the changeup off that." Marson also complimented the way he controls the running game and holds runners, which is unique for a prospect his age. "I can't say enough about him," the manager said. "I'm excited to see him come up through the system and continue to develop." Mobile right-hander Ryan Clark struck out three in two clean innings of relief to earn the save and make Zach Houchins' RBI double in the first hold up as the only run support required.